A Triple fusion involves fixing together all the joints at the back part of the foot such that they become solid and never move again. Much like a fracture unites so the bone should grow across between the bones (Talus/Calcaneus/Navicular) becoming one solid structure. Triple Fusion is a recognised treatment for improving the chronic pain of arthritic hindfoot joints, it can also be used for correcting deformity. It is considered in the situation where all sensible and practical non-surgical methods have failed to provide or sustain adequate quality of life with respect to pain and mobility related to the joints to be fused. A nice animated video of the procedure is available by clicking on the images above. It represents the principles I use though the recovery may be more casting rather than Boot in the initial stages. Triple fusion has been shown to surgically work in up to 85-95% of cases. However the patient satisfaction resulting from this surgery is a more realistic 80-85%. Stopping the joints from moving causes stiffness in this part of the foot especially moving the foot from side to side, this is however often acceptable in the presence of a significant reduction in pain. Other potential complications are discussed later. What is the ‘standard’ Triple Fusion recovery like? Triple fusion is performed as an inpatient procedure and usually under a General anaesthetic unless there are medical reasons to avoid this. You will stay in for 1 night, occasionally longer. What about walking after Triple Fusion? For various reasons, during triple fusion, its recovery or even recognised before we start , it may be necessary to stay in a full cast for a full 12 weeks or more after the surgery. This will always be discussed and explanation provided. What I can I expect longer term after a Triple Fusion? A successful triple fusion should provide significant improvement in pain and therefore mobility. The joints in the rest of your foot, ankle and in-fact your knee adapt to the triple fusion. Some people notice a significant alteration in the way they walk due to the stiffness, most are affected much less. What are the downsides to Triple Fusion surgery? 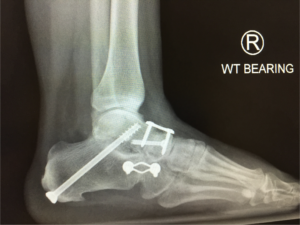 With the hindfoot joints fused together the other joints in your foot and ankle have to adapt and perform movements or functions they were not expecting or designed to do. What are the Alternatives to Hindfoot Triple Fusion? Unlike a knee or hip joint there are no recognised joint replacements for the hindfoot. What are the Risks of Triple Fusion Surgery?